← Little Tokyo’s Seryna: Best. Chirasizushi. Ever. Another mass update, just to help me catch up. Lord knows I have tons of pictures, ready to be written up for posting, on my hard drive. Since these three are pretty ordinary, just let me do quick rundown for each. Bento #1 has yummy Fish Tocino prepared donburi-style over organic brown rice, sprinkled with some chopped green onions for added oomph. The fish tocino was purchased from Citra Mina, a frozen seafood store in BF Homes Paranaque. It was my first time trying it and I was pleasantly surprised. You wouldn’t think it was fish because it had a texture similar to pork. It’s great for those who are craving for a tocino fix but can’t because they need to avoid pork. Bento #2 is a simple enough affair. I took a pork fillet, dusted liberally with freshly cracked black pepper and a smidgin of salt, then fried. It’s too simple, yet it’s enough to make me happy. In fact, I kept pinching bits as I was putting it together, it’s a surprise I still got enough to eat for lunch. Along with that, I packed some left-over chorizo de bilbao, skewered with tiny picks for cuteness. Then, I steamed some green beans for my vegetable requirement. Oh, and I stuck an umeboshi (Japanese pickled plum) on my rice, just because I felt like it. Bento #3 is an all-out leftover bento from BF Homes Paranaque-based restaurant Toho Restaurant. A family-style restaurant, the servings are large so I got lots of leftovers last time my family ate there without me. Fortunately, even their leftovers are good, so I gladly packed them for lunch. Shown is their Shanghai Fried Rice, Lechon Macau (with pickled papaya) and Beef with Broccoli. The strawberry sauce container holds sauce for the lechon macau. I actually packed everything straight from the fridge, stuck it back in the fridge as I got to work, then just microwaved right before lunch. Happiness! That’s it for this post. I still have a couple of backlogged bento posts, but since they’re of the cute persuasion, I’ll write them separately so I can include how-tos. Hope you guys look forward to it! This entry was posted in bento, restos & eateries and tagged baon, bento, bf homes, brown rice, chinese restaurant, citra mina, fish tocino, fried rice, lechon macau, leftovers, lunch, obento, organic brown rice, packed lunch, toho, toho restaurant. Bookmark the permalink. 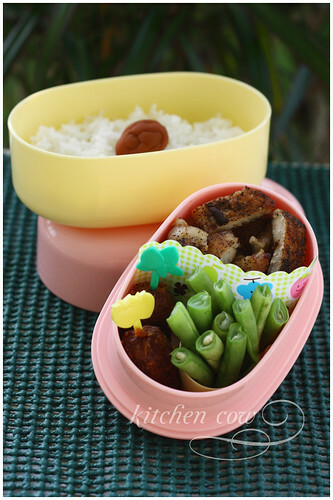 Even your simple bentos are nyum!!! That fish tocino seems really yummy! Hi Kaoko. 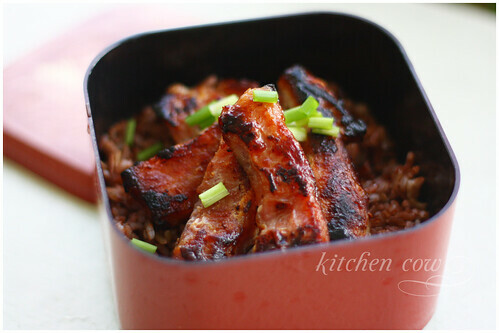 The fish tocino with brown rice look yummy and healthy. 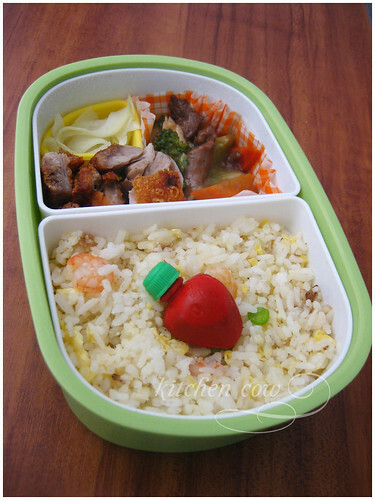 Please do naman a post on diet bentos I think bento meals are perfect for those who want to lose weight. I’m with Mrs.G on this one! 😀 I think I’ll try the fish tocino sometime! To the admin of this site, please disregard the message of the user ‘edxone’. I am the owner of the site mentioned and some guys jealous of my site’s traffic is trying to sabotage it. I’ve been watching this guy for days now. I apologize for your inconvenience on this matter. I’m with Suzanne on this… even your leftovers look incredible. You have a gift. I’ve been bento-ing for a ling time and am lucky if they come out so cute! great looking bentos as always! I really love seeing your bentos. They always look so delicious! Wow! I’ve finished backtracking your posts. Haven’t been here for quite a while..uber busy kasi. I haven’t tried fish tocino before but it looks yummy! I’ll hunt for some in the groceries later. It was! It really doesn’t feel like fish. I highly recommend it. Honestly, it occurred to me that it was a possibility—that a third party was responsible. Still, I do hope you’re able to iron it out with Google. I hope you understand that I had to make a report, lest the person behind it make good his/her thread. Thanks for taking the time to backtrack 😀 And I hope you manage to find some of that fish tocino. It's really highly recommended.